"The Ger". 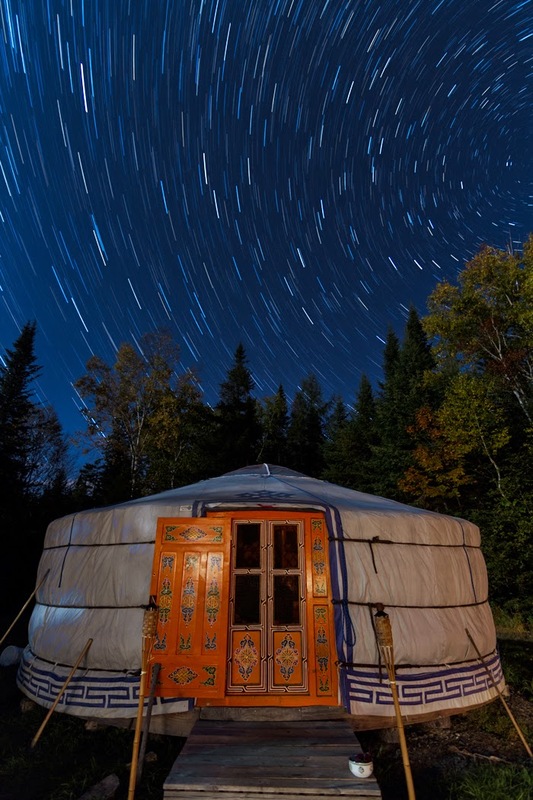 A traditional Mongolian yurt where I stayed during my trip, photographed under the abundant stars and moonlight on the evening of my arrival. This past week I had the opportunity to spend a few days photographing fall in the Adirondacks near Lake Placid. While there, I stayed in my sister and brother-in-law's Mongolian yurt (also known as a ger) on the outskirts of Lake Placid. They erected their ger on the farm where they keep their horses and they live there during the summer, and any other time when they don't have to live and be on-duty at the apartment in the nearby boarding school where they work. It was a fabulous base of operations for my photography trip and also provided a wonderful photographic subject in its own right. Staying in the ger reminded me of my college days care-taking the rustic UMass Outing Club cabin in the White Mountains of New Hampshire. There is something about stripping away the modern conveniences of electricity, plumbing, etc... that turns everyday activities like eating, washing, getting dressed, and even going to the bathroom into rituals, infused with much more significance than we usually give them in everyday life. Recently, I've been studying mindfulness and mindfulness meditation and I think this has a lot to do with how these simple tasks gain such significance in these rustic settings. When the conveniences, that allow us to do these tasks at speed and with our minds elsewhere, are stripped away, it forces us to slow down and be truly present in what we are doing. This is the essence of mindfulness. Whether this effect will hold in the long-term, as you become more accustomed to the rustic way of life, or whether it is more of a vacation phenomenon, I don't know. I suspect the effect may diminish with time, if you let it, but not completely. I'll have to ask my sister. Stay tuned to the blog. Over the next week or so, I'll be trying to post new images from the Adirondacks every day. It was a glorious trip and I have so many images to share. The crown or Toono of the ger and the roof supports from the inside. My sister has also strung Tibetan prayer flags along the back (north side) of the ger, which is traditionally where the altar is located. Excellent post Eli. 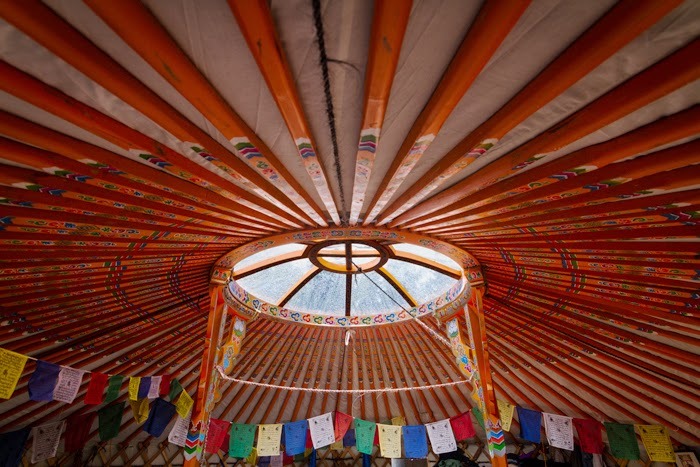 I especially liked the inside of the Yurt showing the Tibetan prayer flags. Glad to see your new level of enthusiasm. I've been trying to achieve a similar renaissance with the advent of nice weather but so far I keep getting rained out!!! Can't wait to see more. I'll be in the field all week with the Tamron 150-600mm (actually 960mm) trying to get some of that old magic back.